Why Should You Make Granola Bars? It’s amazing how large the choice is for nutritious food bars in the United States. Almost any grocery store, drugstore, hotel lobby, fitness center, or other establishment selling snacks will have a variety of food bars for sale. For instance, there are fruit bars, nut bars, protein bars, granola bars, fitness bars, and many other types of bars carrying different names available to purchase. Well-known and newer brands compete strongly for this high-end market dedicated to people active in sports, craving a nutritious and tasty source of energy. People are willing to spend significantly more to indulge themselves by eating a snack that promises to make them healthier, thinner, or more fit. Or even just to appear to their friends as caring about their health and image. As people everywhere become more health-conscious, their cravings for nourishing food bars will cause this trend to spread to new places across the globe. With so many healthy fitness snacks available at any supermarket, why waste your time making your own granola bars? Here are a few reasons that quickly come to mind. First, you can ensure that all the ingredients used to make your bars are top quality. You can decide which ingredients are worth spending more money on. For instance, by buying organic ingredients. Or you may be lucky to have access to fresh crops of grains or fruit to use in your bars. Farm directly to your table! 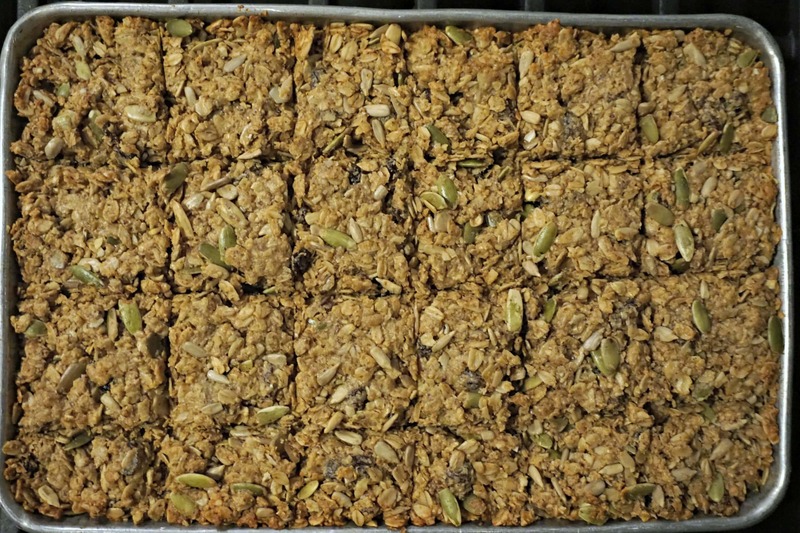 Second, you can make gluten-free, vegan and/or organic versions of granola bars if you prefer. In this way, you can use agave nectar instead of honey, for example, to make sure your granola bars are vegan. Or use oats, millet, amaranth, buckwheat or quinoa to create gluten-free granola bars. Third, you can choose which ingredients to put in your granola bars so as to avoid any allergies that you or your family members may have. Likewise, care can be taken to stay clear of any allergens in your kitchen so as not to contaminate your granola bars. Fourth, by preparing your own granola bars, you will save lots of money. Some estimate the savings to be about 60%. Buying a selection of bars for yourself or for your family each week can be quite expensive. You might try purchasing them in bulk at a discount store. Yet, be careful to read the list of ingredients on the wrapper. Many food bars promote themselves as being natural and healthy. Nevertheless, they contain palm oil, sugar, corn syrup, preservatives or other ingredients better to avoid. In about a half hour you can prepare twenty-four Healthy Vegan Protein Granola Bars. Most of this time is passive as the granola bars bake in your oven. You will soon discover how easy it is to make these nutritious goodies for your family. Depending on your needs, you might prepare a week’s worth in only thirty minutes. To explore several hundred recipes for granola bars and other healthy snacks, check out my Pinterest board Healthy Fitness Bars – Food on the Go! The natural sugar and fat in granola bars help preserve them for a long time. Vegan granola bars in addition do not have any eggs or dairy products that might spoil more quickly. It’s best to store your bars in a cool dry place. They can stay on a counter easily a month if properly wrapped. Wrapping granola bars in individual serving sizes will make it easier for quick consumption. Using waxed paper for wrapping is probably the least expensive and most efficient choice. You could also use aluminum foil, yet it would be more expensive and less environmentally friendly. Storage in a refrigerator or a freezer will preserve your Healthy Vegan Protein Granola Bars for up to one year. If you freeze them, just take them out the night before so they thaw out for the next day. 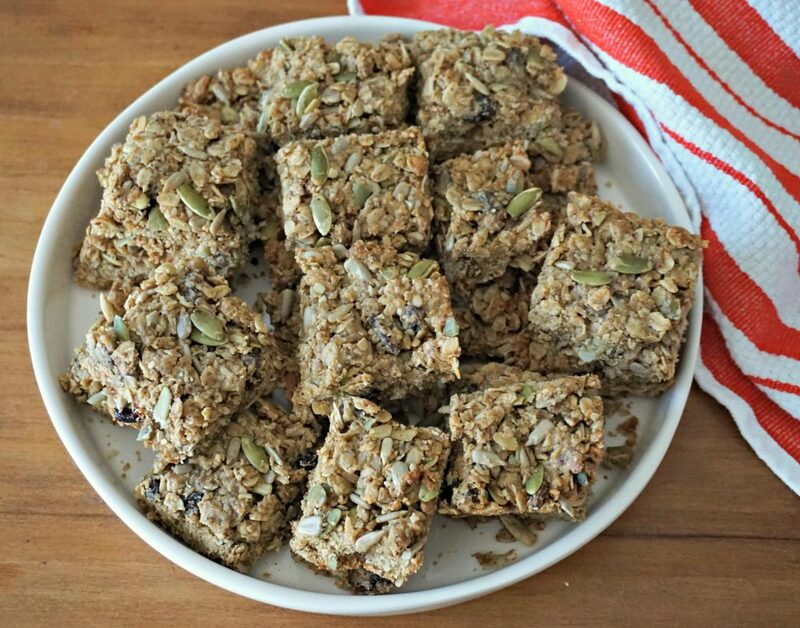 Consider this recipe for Healthy Vegan Protein Granola Bars as a guide. There’s no need to follow it exactly. Nor is there a single way to make granola bars. Feel free to use your preferred nut butter, seeds and grains. Let your inspiration lead you to make new tasty creations for you and your family. 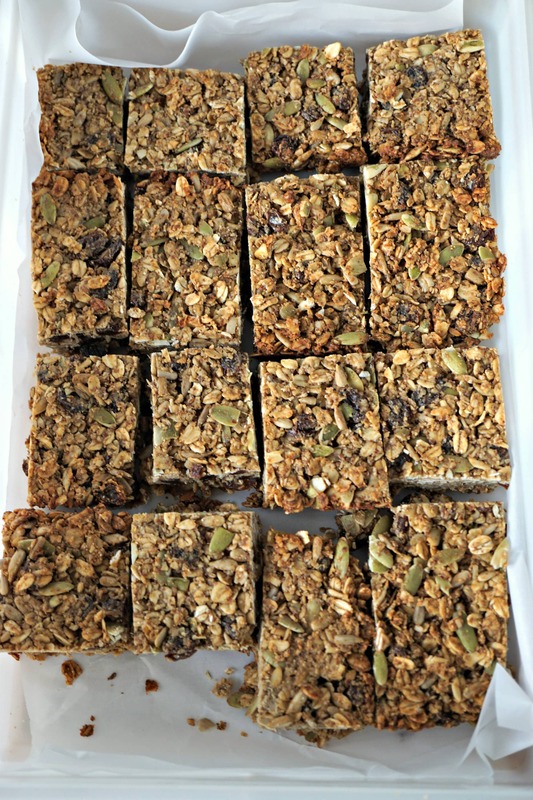 I hope this recipe will steer you to prepare loads of granola bars for family and friends. Please share the recipe of your favorite new creations via the comments space below or by adding #belgianfoodie in your shares.. Use the social media links to forward this recipe with your friends. Spread the joy. 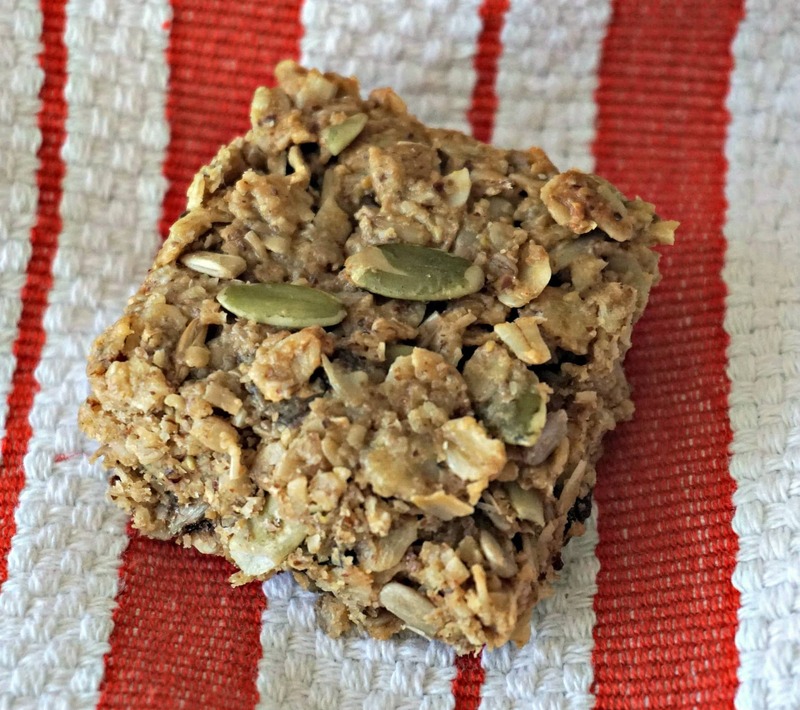 Healthy Vegan Protein Granola Bars are quick and easy to prepare. Use this foolproof guide to create tasty granola bars for your and your family. Mix all the dry ingredients (i.e., the first 8 ingredients above) together in a large mixing bowl. Mix the liquid ingredients (i.e., the last 4 ingredients above) together in a mixing bowl. Blend together the contents of both bowls using a large wooden spoon. You do not need to blend a long time. Merely make sure the ingredients are mixed gently together (like you would with muffins) and that the raisins and seeds are spread throughout the mixture. Line a large baking dish or cookie sheet with baking paper. The size of your pan will depend on the quantity you make of the granola bars. The dough should be about one-half to three-quarters inch (about 1 to 1.5 centimeters) high. Place the pan in the oven on a middle rack for about 20 minutes or until golden brown on top. Remove the pan from the oven and let the bars cool completely before cutting into individual bars. It's cleaner if the bars are cool or cold, yet you might not be patient enough to let it cool. If I make them in the evening I try to put them in the fridge over night, but this is not necessary. Cut the individual bars into the size that you like. Wrap them in waxed paper with a rubber band for future consumption. See notes. It's best to store your bars in a cool dry place. They can stay on a counter easily a month if properly wrapped. Storage in a refrigerator or a freezer will preserve your Healthy Vegan Protein Granola Bars for up to one year. If you freeze them, just take them out the night before so they thaw out for the next day. Great recipe Brad. It’s always better to make your own food. 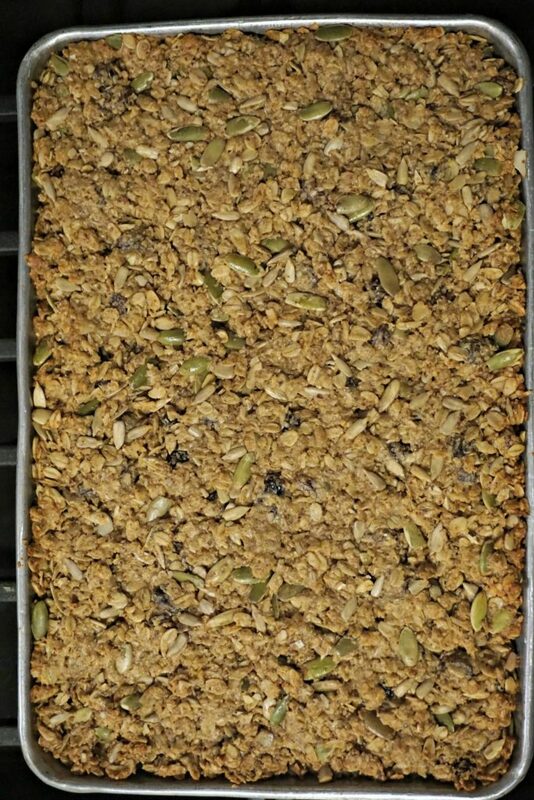 I’m always looking for other granola bar recipes. I started making them some time ago for my daughter as a snack for school or before her volleyball workouts. I love the flax seeds in these. Thanks, Malika, yes it’s always fun to discover new variations of granola bars. You can easily substitute some of the ingredients for like items to create new granola bars for you and your daughter. Enjoy! These look wonderful, but I would probably throw in dried cherry or apricot or both. Happy weekend! Can’t wait to go over and see your sourdough recipe starter. I love sourdough having grown up on the west coast. 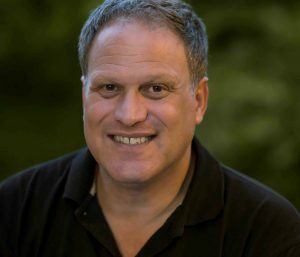 Thanks, Kellyen! Yes, dried cherries or apricots would be yummy in these granola bars. 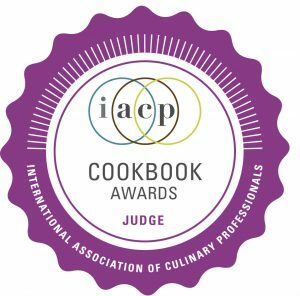 As you can see, the recipe is a guide to help you create your own inspirations. Enjoy! Let me know if you make your sourdough starter and how you like it.